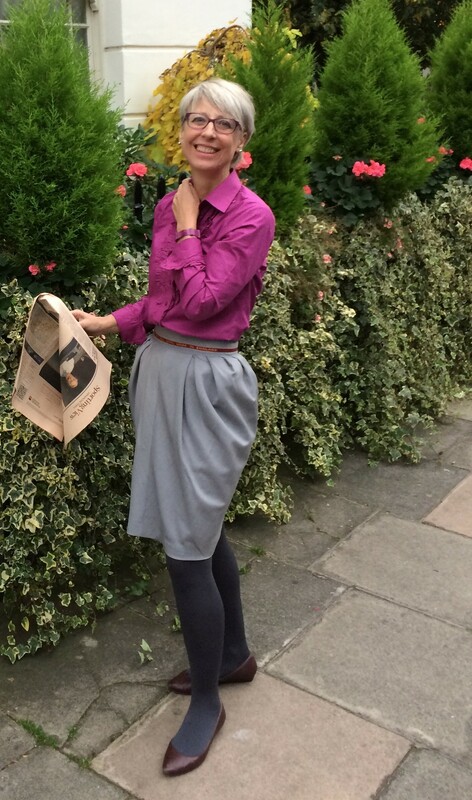 I shared the Grey pegged skirt with you recently. Here is a reminder. A dramatic shape, but a classic and wearable skirt. I wore it yesterday at the Mayor’s Design Advisory Group and I felt appropriate amongst the architects and developers. This post covers it’s Ugly Sister, aka the Navy one. The navy pegged skirt was draped to create a neater, less exaggerated silhouette, with the straight grain at the CF allowing me to cut the skirt on the fold. I wanted a contrast to the slightly billowing grey one. But I made an elementary mistake. A mistake I didn’t discover until I tried it on, at the hemming stage. I had made up the skirt, underlined it, lined it, inserted a nice zip, made the waist band, stitched it (almost perfectly) in the ditch. I stood on the counter and my dear husband pinned it and I still didn’t realise the fatal mistake. It was comfortable on the waist, and across the high hips. It skimmed the thighs, and I thought it was sucessful. The problem of course, with this style of pegged skirt is that the skirt gets narrower all the way down. When it meets the knees it was actually fairly tight. And while the skirt looked pretty good when I stood up straight, and even allowed a small stride, when I sat it was completely uncomfortable. Like Spanx, only worse. This skirt is tight across the thighs! It is a funny feeling – to have just your thighs encased. To cut a long story short, this is not a skirt for me. Maybe on a very young woman, as a super mini, this might work as a fun item. For me to wear to work it was out of the question. I could go back to the drawing board and redrape the pattern with much more ease in the skirt. 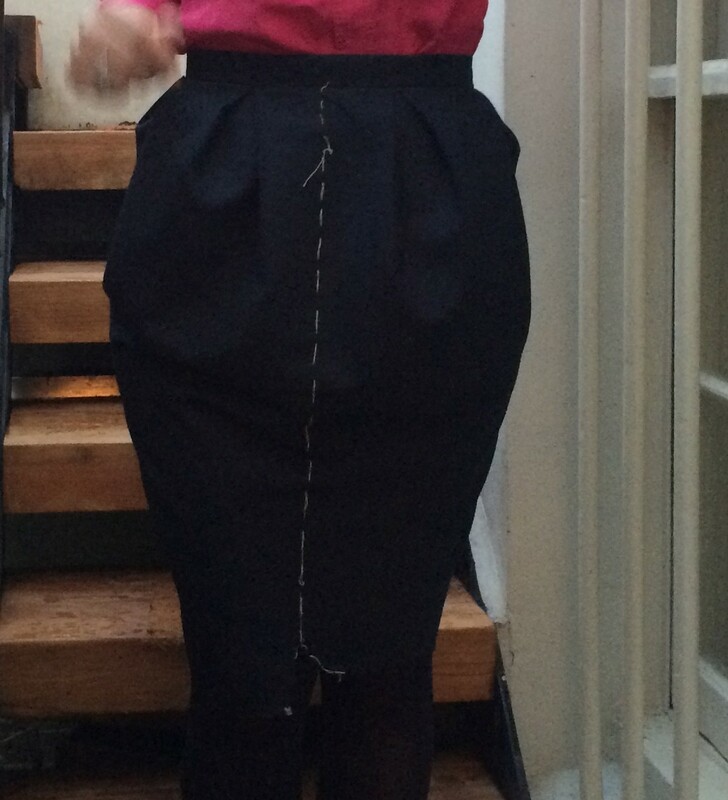 The thing is I now have two pegged skirts, and that is probably (more than) enough. However, encouraged by pegged skirt fiend and 1980s designer Linde Carr, I have begun to think about the pegged skirts cousin – pegged trousers. I love the navy skirt but if you find it restricting then transfer the peg pattern over to a trouser shape and that will look great and more comfortable. Well how clever is that. Yes – use the draped skirt pattern and attach to an existing trouser pattern! I will have to try this. You are a genius Linde. Such a shame because the shape looks great but there is nothing worse than wearing something uncomfortable. Comfort is always my number one priority! Oops! The grey one is so nice it makes up for the navy one. Very sweet of you Louise. Thank you. Oh well! It looks nice, pity it doesn’t work for you. Pegged trousers? Never, ever for me! I look forward to seeing your rendition but my mind fills with horror at the thought of some I’ve seen in the past! Trousers with a pegged or draped top? My UFO box includes a half done pair, batting off some in “The Art of Dress Modelling” by Lily Silberberg and Martin Shoben. I concluded that I needed very fluid fabric. Too bad you had all that work invested before realizing how tapered this was. You make a great point for doing a muslin before cutting fabric or at least basting together and doing a try-on before sewing. Pegged pants are a vintage style. I would be sure your fabric was very soft and fluid unless you want a mega-bum look. I’ll be interested to see what you come up with. Of course – toiles are always a good idea. I have learnt this lesson before! I am kicking myself as it almost worked…. Oh no! I love the front pleats, thin waistband and colour though. I love front pleated trousers, so can’t wait to see those. I made my pleated navy ones with cotton last year, so they puff out a bit at the top (very comfy), but I would think that ankle-length, pegged trousers with a high waist, in a fabric with drape, would be lovely. I’ve been looking at similar patterns for some navy wool crepe. Pegged trousers sound a lot more practical! Stairs….the challenge whether you are in a pegged skirt or a mermaid gown…it’s such a pity that we need more room for the knees to bend and separate just to relocate us from room to room. But even with a small speed bump in the road it gives us all a lesson and a great blog post! Maybe this skirt can be flipped up side down and the wool used in a different way? Stairs! Mermaids! Dislocated knees! You are a hoot Mrs Mole. I will just throw it away and put it down to experience. I suppose someone very young and slim could chop it off at thigh level and have an interesting mini! Doh! I’ve been there. It’s all about the process, on to the next thing. My feeling exactly. Life is about learning. I never reach perfection. Oh dear – what a shame. You made such a good job on the stitch in the ditch as well. Still, it all adds to our experience. The joys of sewing! Very sad because it does look lovely, but every unwearable make teaches us so much. Onwards and upwards! The drape is beautiful on both of them! it might sound silly, but what about making them shorter and opening side slits? Hi Ina! Thank you so much for your kind advice. Shorter would work, but this would be at the upper thigh level – like shorts without the modesty! I did try having a front split but again it would have to come very high, and side splits sort ruin the line. The only answer is to alter the pattern and start again, I think.